Late last year a few friends and I attended the 'International Equestrian Extravaganza' (as stated in the programme!) 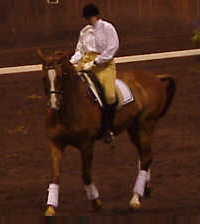 held at the State Equestrian Centre. The 'star', was of course Anky van Grunsven, who held the decent sized crowd enthralled as she gave a 'master class' to different riders ranging from Preliminary to Grand Prix level. 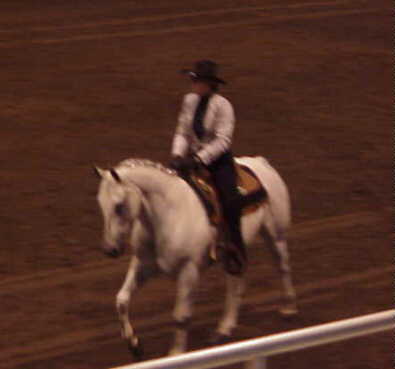 Wearing a microphone, she would instruct each rider individually, although she only actually rode one horse. It was a very entertaining and informative night which also included showjumping as well as a bridle-less western display. I took masses of photos using a digital camera, and the better ones I finally uploaded just recently (February '99). Enjoy!! Please don't remove any of these photos! 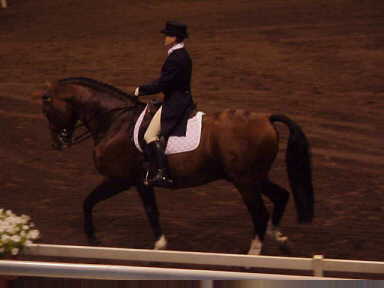 The following photos are of Amadeus (the horse in the photo above), who is ridden and owned by Sonia de Berner. Amadeus is a Part Bred 16 year old gelding who has represented Australia at Grand Prix level. For their freestyle demonstration he was covered in glitter and had bells plaited through his mane! This is Anky van Grunsven herself riding! Everyone had hoped she'd ride more than she did (for about five minutes), but the effect she had on this particular horse was just amazing. 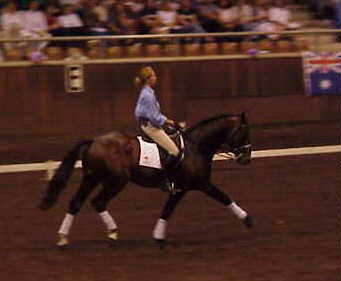 The horse she is riding is Courage, a holsteiner stallion by Contact out of Epsilon. 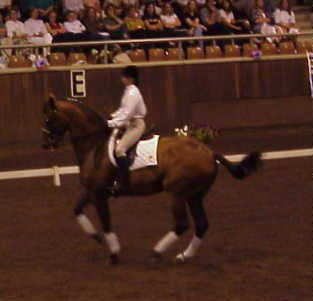 His rider was Christopher Sharpe, who was demonstrating Medium (approx. 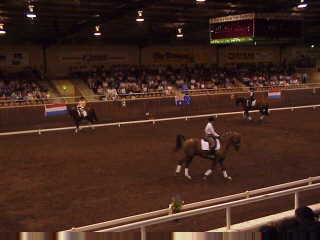 3rd Level in USA terminology)Level dressage before Anky hopped on. 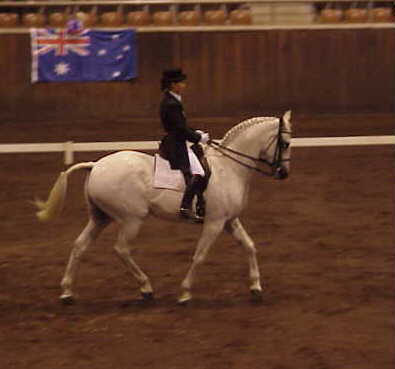 The following horses were all demonstrating various levels of dressage while Anky would give them a 'master class'. 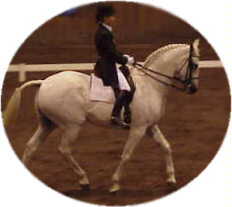 Nordic Speculation ridden by Jennine Smith. He is a Danish Warmblood by Kilof McOhl (IMP) out of Jade Green (TB). He is 11 years old and graded FEI. He demonstrated Inter II/Grand Prix level work, and is a possibility for the Sydney 2000 games. 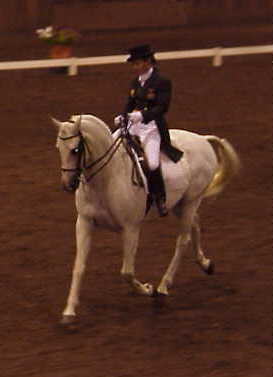 Middleton Aapollo , who demonstrated Andvanced/Prix St. George level. 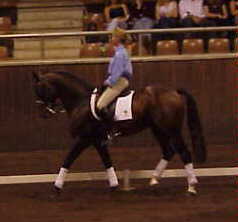 He is ridden by Tracy Lee and is an Oldenburgh/Trakehner, by Aachen (IMP) . Barrabadeen Troubadour, an 8 year old Holsteiner stallion. 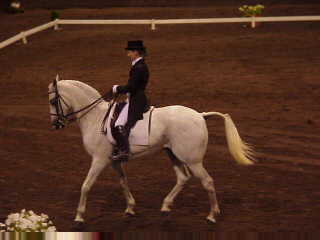 He is graded advanced (4th level) and is ridden by Nadine Merewether. They performed a medium (3rd) level freestyle demonstration. This is a shot of the fashion parade (note stockings & suspenders wearing Christopher Sharpe on the left!). Delta Park Decade - last by definitely not least!!! Ridden by Adam Geldard and graded Medium Level dressage, Decade (8 year old Australian Warmblood stallion) and Adam performed a truly amazing showjumping display. 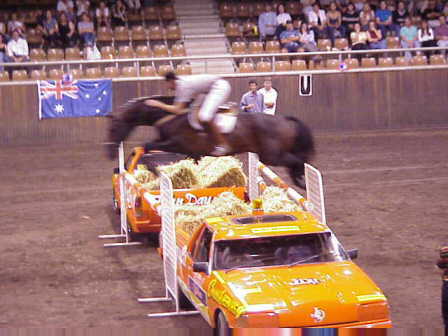 This photo isn't at the biggest height, and he actually ended up jumping it bare back, with the two utes (pick ups in the US I think?) pushed totally together.